Making coffee, buttering toast, walking the dog, washing the dishes, folding the laundry, and wiping down the sink again… It’s a stay at home mom’s life, and it’s all so b-o-r-i-n-g. If I’m not careful, these little tasks begin to mock me. This is all you’re really good at anyway. Your effort doesn’t mean anything because it will be undone and you’ll have to do it again. And my mind gets a one-two punch if I fall behind or things look cluttered. Discouragement is like a shadow, stuck to me. A constant reminder that I am what I do, and what I’m doing isn’t amounting to much. A friend once called life as a stay at home mom of young kids “baby jail.” And I remember thinking that while a lot of that image doesn’t work, one thing strikingly does: the angst of feeling stuck. I don’t like feeling stuck. So, I Make Over My Mornings or work through a book on cleaning with the right heart, and I take ownership of making more with my life. I want to live up to my purpose. Because after all, the whole reason I’m home is to fulfill a greater purpose than wiping sinks, noses, and buns. But nothing can really change. I mean, I change, my attitude can change, but the fact that I’ve listed out my priorities doesn’t magically transform what it looks like to be a stay at home (schooling) mom. Being stuck in a stage isn’t a problem to fix and no amount of making over will ultimately change what I’m called to do within each stage. So, I own my boring life stage. I accept the thrill-less-ness of folding laundry for the thousandth time (only to run across clean laundry in the dirty pile again). Focus on enjoying one part this stage each day – and do it with all your strength. Nap, color, or scooter with them because all too soon these pastimes will be in the past. Don’t become over busy by default. Running out to Target again, will not help. Put the van keys down. Avoid burn out by staying accountable for rest. People on Facebook don’t need to know your status at 10:00 p.m. You need to know your pillow. Take time to develop better self control – it isn’t about saying “no” to yourself, it’s about knowing yourself. Sometimes it’s okay to scroll through Instagram while waiting for the wash cycle to finish, and sometimes it isn’t because a child could really use your face to face time more. Only you can determine what you need to say no to in any given moment. Make sure to know what is best before spending your time. At the end of the day it isn’t about whether you’re satisfied with what you did, it’s about whether you’re satisfied with who you are becoming. Please don’t stay stuck. Reach out. Accept encouragement. Try something different. Set small goals. 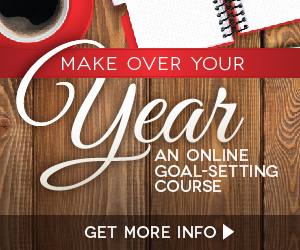 If goal setting seems impossible right now, try this course (which goes on major sale Friday) or the Make Over Your Mornings one. And please feel free to ask me for help too. Join my accountability group for more personal encouragement. Again, nothing will change the stage you’re in, but any one of these can significantly help you get unstuck. Some of the links in this post are affiliate links. Find out what that means by clicking here or feel free to contact me by clicking here with any questions. Thanks! ← Salvation isn’t found there.